One of the key things you need to think about when you look into a new product or a business case for a new business is the key “Value Added” work that will be done. When you are planning to offer services to a customer, are they truly willing to pay for them? Are you adding in extra stuff that you know how to do, but that the customer would just as well do themselves? Are you trying to monetize on the highest value added activities or do you need to re-think your revenue model? 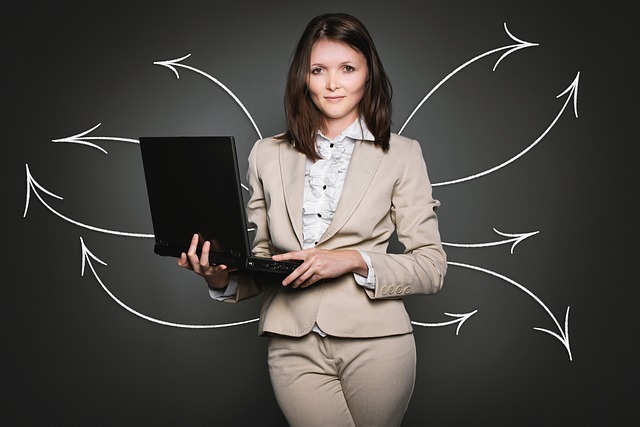 We’ll take a page from Six Sigma’s Non-Value Added (NVA) assessment, but turn it on it’s head. For this exercise, take the business idea and break it down into 5 to 10 steps that you will do when delivering your services to the customer. Then we’ll analyze each of those steps to see if they’re actually worth having your business do. If your business services are full of Non-Value Added activities, then it’s time to take a hard look at whether or not this is a good idea. We’ll then look at what the process may look like with only the top value added steps to see if you can re-think or “Pivot” your business to focus on the high value activities. This is a simple one page template with a few updated workflow selection options. Write in the high level steps of the product you’d spend your time delivering to the customer. This is fairly open ended, so put in whatever you think you’ll be delivering and how you’ll interact with the customer. If you want to get into a full blown Non-value Added assessment of your existing business processes, this isn’t the right tool. Fill in the answers to the questions about each activity. You’ll find that you want to answer “Maybe” on a few of the Yes/No answers… you need to get specific and honest here. The two 0,1,3,9 Ordinal Scale answers have descriptions for each in the comments attached to the header. Hover your mouse over the header and it’ll show you the guidelines for scoring. As you’re working through each row, you should have some interesting realizations about what you’re planning to spend your time on. Do your customers really care about the hard math and equations behind business statistics? Probably not, but they DO want to know the results of analysis based on those statistics and what to do about them. Once you’ve scored all of your activities, if you haven’t re-written half of them go ahead… you don’t have to do this linearly. In the lower section we have three options to show what a high value only service would look like. Select 90% for the Hurdle Level and then No for Monetize and Big Bucks steps. This might be your new Idealized product flow. Can you make that into a business? Try putting in some of your “Monetization” or “Big Bucks” items with the Yes/No options. If either of those options adds back in steps that aren’t high value added activities they’ll show up as red text. This is something for you to take a hard look at. If they’re not high value, why would you think a customer would pay for them? Is there a way to make them high value? Is there a better way to monetize? Should you be trying to monetize in a different manner or different part of the flow of services? Ideally you’d have NO red items and all of your monetization and big bugs items would already be on the top list. If you answer every single line item in this ideal way, then you have an incredibly “ideal” business and I’m jealous, as well as skeptical. You will score 100%. 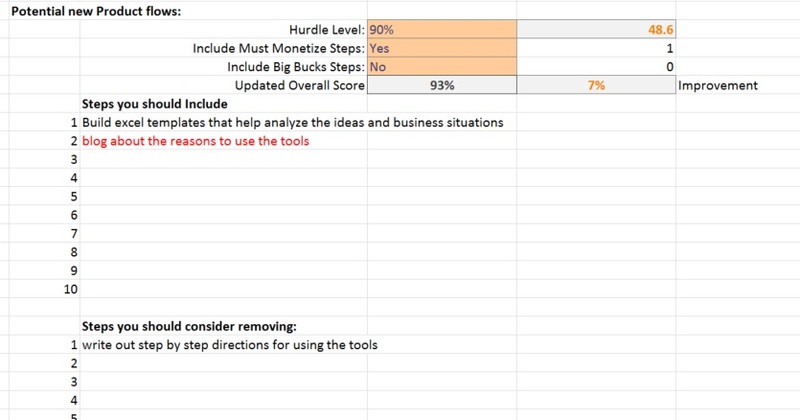 The New Product Flow section also looks at how much improvement you’ll see in overall ideal business scoring if you can use the suggested steps and remove the low scoring steps.